»» Places his vision in continuity with his papal predecessors (§§3-6) and in harmony with non- Catholic religions and secular thinkers (§§7-9). 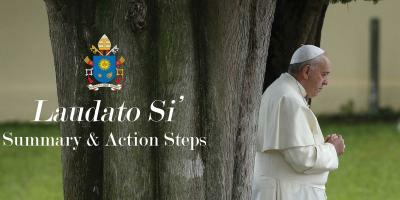 »» Shows how Laudato Si’ is animated by the spirit of St. Francis of Assisi, patron saint of those who promote ecology, and emphasizes the importance of these spiritual roots: “If we approach nature and the environment without this openness to awe and wonder, if we no longer speak the language of fraternity and beauty in our relationship with the world, our attitude will be that of masters, consumers, ruthless exploiters, unable to set limits on their immediate needs. By contrast, if we feel intimately united with all that exists, then sobriety and care will well up spontaneously” (§11). »» Urgently appeals to all persons “for a new dialogue about how we are shaping the future of our planet” (§14).